Taken at face value, this is a pretty good pair of late Golden Age sci-fi stories, albeit with more footnotes than one would expect in the genre. The writing (or editing) is punchy. The plot drives the story, rather than the need for constant exposition, as is too often the case in texts like this. However, the real importance of these texts is historic. 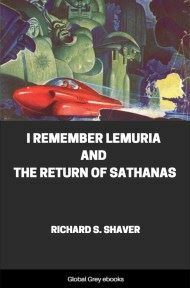 The Shaver mythos had a huge tacit influence on 1950s and successive UFO belief systems. For instance, Shavers' 'Nor,' blonde demigods from outer space, suggest the 'Nordic' aliens of UFO lore. The tunnels of the dero became subterranean alien bases. Embedded in this short science fiction story were many of the themes which would later become accepted UFO canon.